You must be a Boa Whisperer too! It doesn't surprise me she wants to eat every 2 weeks, all my boas on smalls eat every 3 weeks (though they'd eat more often if I let them). So long as she isn't actually striking, I likely wouldn't worry. My boas sometimes go through periods like this, I assume it's just them needing a little extra food. Depending on their body tone, I either increase feeding frequency by a week until the behavior stops, or I just wait them out. If they're of good body tone, and I'm not breeding, they eventually snap out of the mood after a few weeks or a couple of months. Her weight, feeder size, and frequency seems pretty good, so it's doubtful she's starving, I'd probably just wait and see if she stops. If she begins striking at the glass, or her weight gain plateaus over 2-3 months time, then I'd try feeding her weekly for a short period to see if that helps. I wouldn't make it her regular schedule, though, snakes just seem to go through periods of heightened or lowered feed response. Last edited by CloudtheBoa; 02-28-2018 at 09:15 PM. Behira left me a really nice, and big, present last night (I found today). I weighed her empty, and she is now 715G. It seems she is putting about 30% of every meal towards growth. Again, feeding small rats every other week (every 2 Sundays). She is doing great with the hook training and everything seems to be going really well. One other quick thing to add. I'll advise if she ever strikes at the front of the enclosure, but she seems to have relaxed a little bit in that regard. Behira is doing well, and looking forward to eating tomorrow (I am sure). The hook training continues to go great and she relaxes more once she sees/get touched by the hook handle. I am getting better at reading her, and that's helping too. It's been over a month since the food response bite, and I am very optimistic. Katie is beginning to believe in Behira again as well. She has held her sporadically since the bite (to be clear - Behira nailed me, not Katie), but not for long (she has continued to spend time with Shayna, Figment, Frank the BTS, and the LG's). I take Behira out 4-6 days a week, even if it's for a short handling session, to continue to build trust and reinforce the hook training. She does not get stressed at all being handled and sometimes I'll hold her for 1/2 an hour watching TV and/or chilling out. Of all the snakes I have had, she does the absolute best staying calm and seemingly enjoys being handled and exploring! Shayna (my adult female BP) stays calm, but after 10-15 minutes, you can tell she wants back in her enclosure and in a hide! Figment (my corn) is so active, I think he just wears himself out after 10 minutes or so. Not so much stress as exhaustion! Anyway, I had Behira out tonight and Katie held her for an entire TV show! They did some bonding and had some girl time. Behira has always liked Katie, although she likes to explore a lot with her and is more chill with me. She especially loves Katie's hair! Katie is good at redirecting her, but recently, the feeling of admiration was not completely mutual. I am so happy that Katie had a wonderful time with Behira tonight and really seemed to enjoy her. She even did a photoshoot with her (excuse Katie's silly faces, she was having a great time). Without further ado, here are two of my beautiful ladies (I don't want to leave out Shayna, the LG's, or Big Bailey Dog)! Glad to see Katie enjoying playtime as much as Behira! Me too . Such a relief! I was nervous for a while and got a lot of push back initially when I asked how she felt about Behira now and/or asked her to hold her. I basically left it alone for a while and continued to handle Behira, often when Katie was around. Sometimes it's better to leave things be. In this case, it worked, and they are good buddies again! As I have mentioned, I understand Katie's hesitancy. She literally had never touched a reptile until she met me in 2016. 8 months ago I moved in and took over her basement with tanks, and added 2 dogs for a total of 5! I know it was overwhelming for Katie, even though she wanted me to move in, menagerie and all. In October, Behira came home to live with us and in December, 13 boxes arrived from Boaphile (the 6X2's ship as 2 3X2's and then are bolted together, plus stands, and thermostats, etc.)! That really worked out well though, because I had tanks all over part of the finished basement. Katie was really happy we were able to stack tanks and get some room back! I like that, but am just incredibly happy with the tanks and how much easier they are to maintain proper temps and humidity. Then, after telling Katie, in years of keeping reptiles (mostly snakes), that I was only bitten once (by a BP baby in 1990 and it was totally my fault), Behira nails me hoping for dinner. Katie didn't see the bite, but saw the blood . 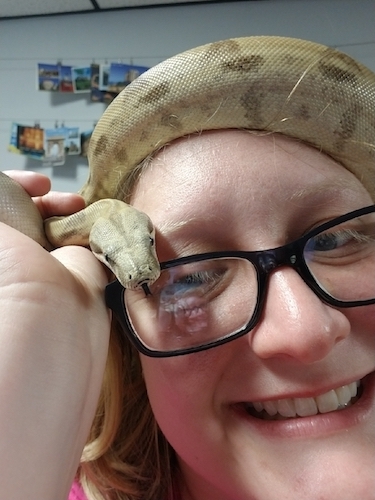 It fed into all her previous fears about reptiles (her parents are not keen on them at all - but even though they do not understand, appreciate that I like them, and Katie's dad even helped me set up the tanks). 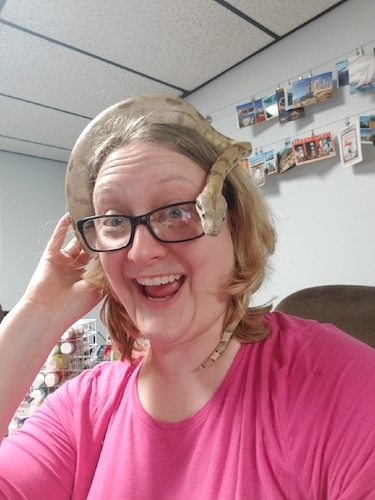 In any event, I am really happy Katie has embraced me, my dogs, and my reptiles! I couldn't be happier! Thank you! Yeah, I think Behira is going be just fine with us for a long time! Too funny that your wife won't go in the snake room! Very good she supports your passion though! Enjoy Egypt! Oh, and avoid the Cobras, if you can. I think their bite might be a little worse than a BCI . Last edited by mlededee; 03-12-2018 at 05:05 PM. I would advise against handling her that much, 2-3 times a week is a good maximum. If you handle them too often, it stresses them out, even if you can’t see it. Of course, there’s no set line for what is too much, but you definitely don’t want to be handling them nearly every day. If she’s docile, she’ll remain docile, but a defensive snake will act in much the same way a dog with learned helplessness would. By overhandling, you’re telling her that nothing is on her terms, she has no escape, and she will effectively “shut down” to deal with it. Any defensiveness will resume if they go without being handled, and may actually become more defensive later on. I actually don’t handle my snakes more than a couple times a month, which is still enough to reduce feeding responses when handling or defensive behaviors. If a snake doesn’t come around, I simply cater my handling to them, I don’t really believe in handling a snake into docility, it seems a little cruel. If they’re meant to be handled, they will take to handling. If all you’re worried about is a feeding strike, your hook should be more than enough to snap her out of it. It’s good Katie is coming around! A bite from a boa really isn’t very bad, and it seems like Behira just made a mistake once, so it would have been a shame if that had caused a permanent falling out.